I was back in California when I first saw a picture of the Dowgy-Allee. I couldn’t wait to get back to Germany so I could check out Münster’s newest DIY with my own eyes. The first evening I got there, I went to go see it. It was amazing. And just when I thought it couldn’t get any better, I heard the story behind it. A couple weeks ago, after a sesh, I got the chance to sit down and chat with photographer Adam Przybyla and Sebastian “Sebi” Niehaus, the man who made this all possible. His brain child, aka the Dowgy Allee, is a testament to what can happen when a little curiosity, some luck, and a lot of love for the game all come together. Curiosity was the first step because before this spot was built, it was nothing. First of all, this spot is on some obscure street that doesn’t go anywhere. And secondly, it can’t even be seen from eye level. It stands some 10 or so feet above the ground, and from down there it just looks like a big abandoned platform that is fenced off to the everyday pedestrians, which is exactly what it is. Or maybe I should, say what it was. Sebi. Early grab to fakie. The first question I asked Sebi, of course, was, “So how did all this start? How did Dowgy-Allee come to be?” He laughed and then repeated the question to himself. “Well, I’ve been living here [in Münster] for six years and I used to walk by that platform every day, but I’d never been up there before. What for, you know? It was a little fenced-off place to be forgotten. It looked like nothing. And then one day I was like, you know what, I’m going to go check it out.” What he found was pure potential with it’s foundation made of good concrete. It had to, however, be uncovered first, for the thing looked like a jungle. Gorch. Krooked grind pop over. The next problem, which was money and man hours turned out not to be a problem at all. Actually it was a blessing in disguise and maybe the best thing that ever happened to the Münster skate scene, which was once separated. 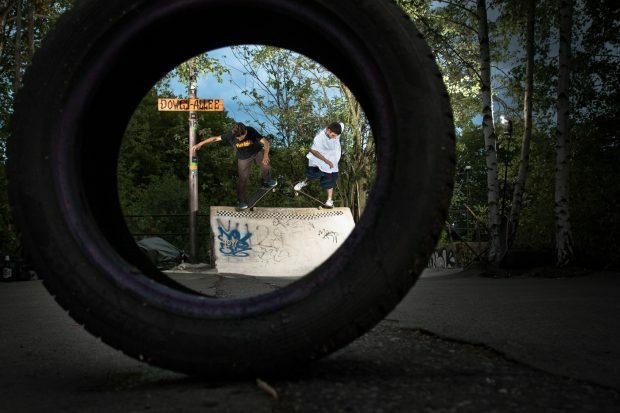 When the whisper of a new spot in Münster spread throughout the skate community, it changed everything. Timo Krone and Tobi Reize. Double nose pick.